While forensic analysis has proven to be a valuable investigative tool in the field of computer security, utilizing anti-forensic technology makes it possible to maintain a covert operational foothold for extended periods, even in a high-security environment. 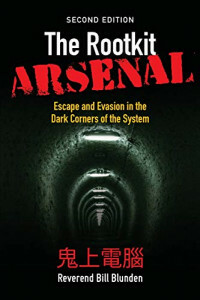 Adopting an approach that favors full disclosure, the updated Second Edition of The Rootkit Arsenal presents the most accessible, timely, and complete coverage of forensic countermeasures. This book covers more topics, in greater depth, than any other currently available. In doing so the author forges through the murky back alleys of the Internet, shedding light on material that has traditionally been poorly documented, partially documented, or intentionally undocumented. Algorithms for Interviews (AFI) aims to help engineers interviewing for software development positions. The primary focus of AFI is algorithm design. The entire book is presented through problems interspersed with discussions. The problems cover key concepts and are well-motivated, challenging, and fun to solve. Programming Game AI by Example provides a comprehensive and practical introduction to the “bread and butter” AI techniques used by the game development industry, leading the reader through the process of designing, programming, and implementing intelligent agents for action games using the C++ programming language. Nobel laureate’s brilliant attempt to develop a simple, unified standard method of dealing with all cases of statistical thermodynamics (classical, quantum, Bose-Einstein, Fermi-Dirac, etc.). Discussions of Nernst theorem, Planck’s oscillator, fluctuations, the n-particle problem, problem of radiation, much more.